For the first time since pulling out of Saturday’s UFC 175 scrap against Matt Mitrione at the last minute, literally, Stefan Stuve (pictured) has addressed his backstage blackout. Struve was returning from a 14-month hiatus after undergoing surgery to correct a leaking aortic value and an enlarged heart. According to “Skyscraper,” what occurred in the locker room just minutes before he was to fight Mitrione had nothing to do with his heart. “I want to thank @ufc, @danawhite and @lorenzofertitta for their ongoing support and confidence in me. 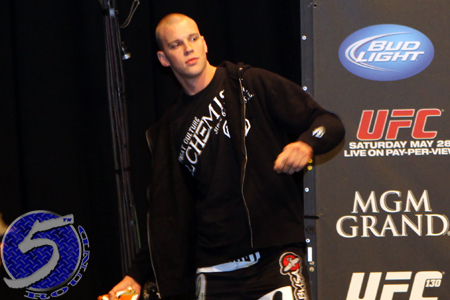 They even paid me show + win bonus,” Struve posted Monday on his official Twitter account. “My team and I are already figuring out what happened and we have the pieces but just need to do the puzzle. Confident we will sort this out. The 26-year-old owns a 25-6 professional record. He has won four of his last five tangos, but lost his most recent appearance via TKO to Mark Hunt.